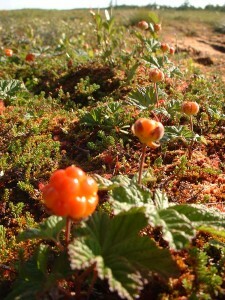 The dioecious cloudberry (Rubus chamaemorus) is a wild berry that grows in subarctic bogs in all northern regions of the world. 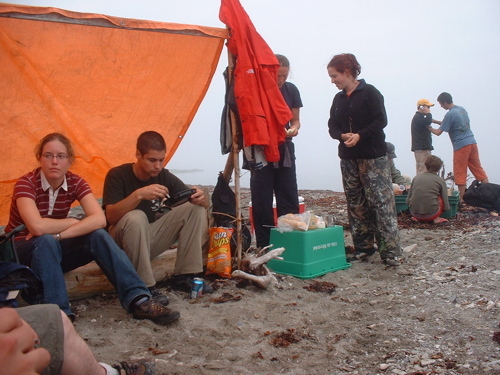 While commercial cultivation of cloudberry exists in many parts of Scandinavia, the cloudberry industry in Canada is currently limited by the quantities collected during manual wild harvests. As an important first step towards the eventual commercial cultivation in Canada, we set out to describe the pollination ecology of cloudberry in its native habitat of northern Quebec. Hand pollination vs. pollinator exclusion experiments allowed us to demonstrate that insect pollinators were essential to the maximal fruit production of cloudberry. 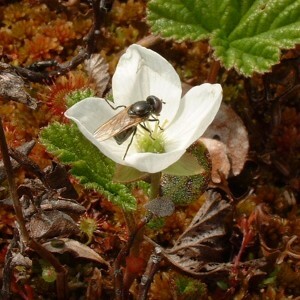 By sampling insect pollinators and conducting controlled floral introduction experiments, we determined that small flies of the Syrphidae and Muscidae Families were the most important pollinators of cloudberry in this study system. Furthermore, comparisons of inter-sexual flower attractants and rewards demonstrated that female flowers actively reward their most important pollinators and are therefore not attracting pollinators merely by deceit, as has been previously reported. The implications for future cloudberry cultivation in North America would be to develop habitat management techniques that promote native fly populations.